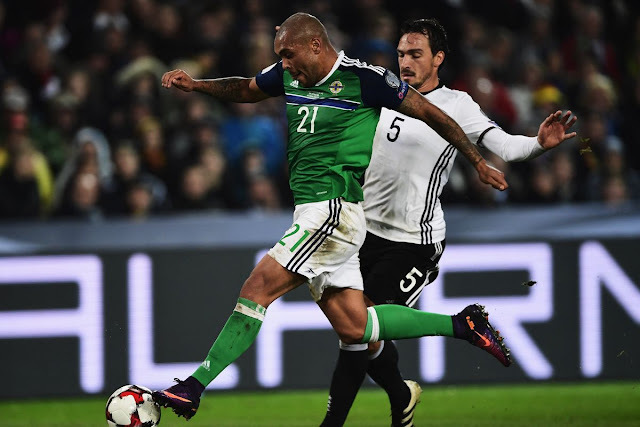 Northern Ireland Vs Germany Kickoff Time, TV channel, live stream, Match Preview FIFA 2018 Qualifiers: Germany is the reigning world champion and would surely be wanting to strengthen their position in the Group C standings of the World Cup 2018 qualifiers. The team would be facing Northern Ireland on Thursday, October 5th. This clash will be telecasted by Sky Sports Football at 7.30 pm directly from Belfast. For online streaming, viewers can access Fox Soccer Match Pass, Univision NOW and Fox Sports GO. The Germans are already five points clear with two games to go. On the other hand, Northern Ireland assured a top-two finish after beating Czech Republic 2-0 in September. Northern Ireland are quite motivated with the return of West Brom defender Gareth McAuley, who wasn’t able to be a part of the last few international clashes due to injury. However, Northern Ireland manager Michael O'Neill hasn’t been successful in calling up players like Paddy McNair, Liam Boyce, Jamie Ward and Craig Cathcart, who are still recovering from long-term issues. The squad has been refreshed with the addition of George Saville and Jordan Jones who would be playing for the first time for the national side. The defence for Northern Ireland need to function well if they need to contain the German lads who have been phenomenal in terms of speed and accuracy. Expected Ireland Team: McGovern; Evans, Brunt, McAuley, McLaughlin; Norwood, Davis, C. Evans, Dallas; K. Lafferty and Magennis. The German squad would be playing Northern Ireland without their ace playmaker Mesut Ozil and Sami Khedira is also expected to miss the game. Striker Mario Gotze also couldn’t land himself in the probable eleven for the game on Thursday held at Windsor Park. The biggest scare for the defending champions is that Manuel Neuer is injured, this means that either Marc-Andre ter Stegen, Bernd Leno or Kevin Trapp would replace the star goalkeeper. There is also good news for Germany with the availability of Jerome Boateng which could surely work to cement their defense. Expected German Team: Ter Stegen; Hummels, Mustafi, Boateng; Kroos, Rudy, Kimmich, Draxler, Sane; Stindl and Muller. Germany are unbeaten since their last 17 matches across all competitions; it includes winning 14 and drawing three. Looking at Northern Ireland, the team has won their last five internationals, acting as a major driving force for their satisfactory performance in these qualifiers. Germany might be landing in this match with a fairly younger side, but they would be aiming for glory with their reputation and willpower upfront. Thomas Muller can be a threat and can surely dismantle the defence of Northern Ireland. Northern Ireland vs Germany Match Prediction: The predicted score would be 3-0 (Germany Vs Northern Ireland).